Despite the freezing-cold temperatures, volunteers showed up to share their time and talent at Ron Brown College Preparatory High School for the City Year MLK Day of Service. 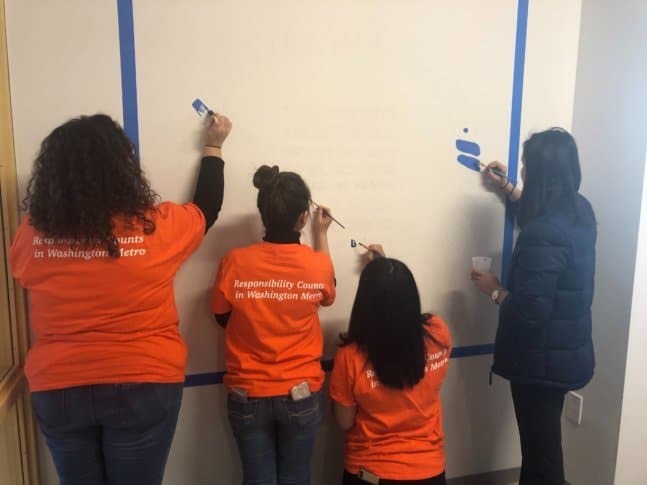 WASHINGTON — Despite the freezing-cold temperatures, volunteers showed up to share their time and talent at Ron Brown College Preparatory High School for the City Year MLK Day of Service. “We’re just so honored to come together here at Ron Brown and at three other sites to transform the buildings and work with the community,” said City Year’s Executive Director Michelle Tafel. Nicole Butts came out with a group of 15 volunteers from United Way. “It was a little overwhelming at first, but it was also so inspiring to see so many people who want to give back and who are here for the kids,” she said. The series of murals throughout the hallways will feature quotes of encouragement and abstract art to uplift and inspire. “We worked with the principals to make sure our messages and what we’re doing in their schools match what they want,” said Tafel. Laray Booker also came out to volunteer. “It’s a day of service and remembrance, so to do that with a group of young philanthropists is the best way to do it,” Booker said. The opportunity to volunteer is one City Year encourages community members to take advantage of year-round. “Find a way to get out there and be part of the community. Volunteer with City Year or other organizations in the city, and see how it fills your heart with joy,” Tafel said.